As my Christmas gift to you, I’m hosting a big Christmas giveaway! I’ve partnered with the Karama Collection to bring you a holiday treat you’ll love! Their artisans create the most beautiful pieces! Everything from scarves, to jewelry, to handbags! To treat you, I’m doing a giveaway of one of their popular leather bucket bags! It’s in a beautiful chestnut color and perfect for everyday. It has a short strap and great shape for a perfect on-the-go purse. This bag was specially created by artisans in Addis Ababa, Ethiopia. Doing each of these actions will earn you points towards winning! The more you do, the greater your chances! The winner will be announced on Saturday, Decemebr 23rd! Repost this week's blog post on Facebook! Post a picture to your Instagram of the best "Frugal Find" you've had this Christmas season and tag @_fashionablyfrugal. You can also send it to me in a direct message on IG if you don't want to post it to your public profile. 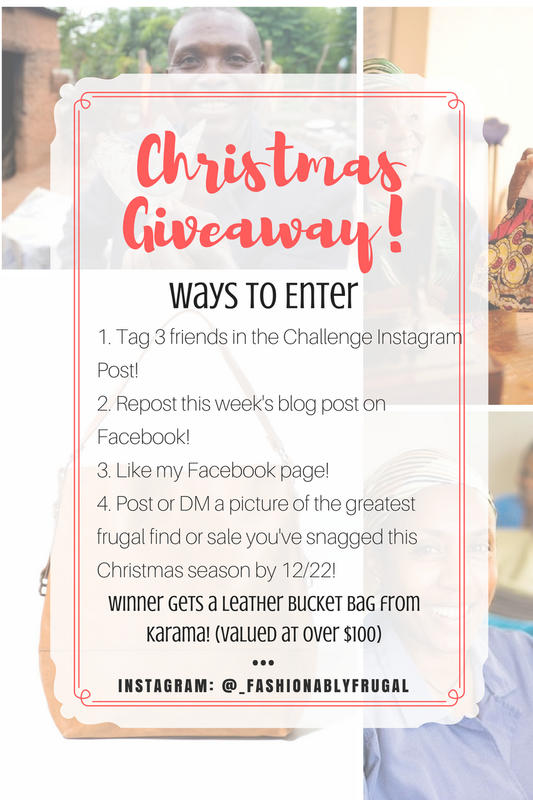 The winner will receive this beautiful Karama Collection bag! Best of luck! Love y’all!